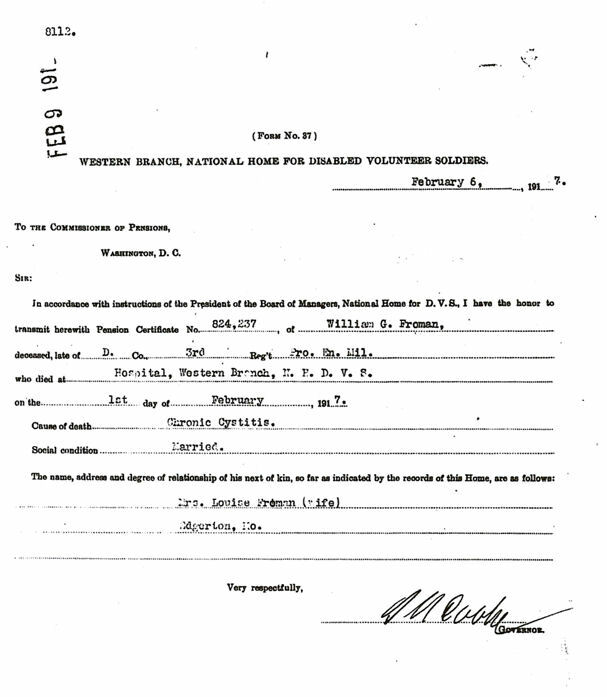 DearMYRTLE's Genealogy Blog: Docu-Challenge: Civil War vet "dropped"
Among the records discovered in the original William G[ist] Froman US Civil War pension file #824237 researching in person at the National Archives in Washington, DC, are several documents indicating his death. This is perhaps the FASTEST response time in the history of the federal government. The fellow died on 1st February 1917 in Kansas, the governor reported the death on 6th February via letter, received at the pension office in Washington DC 9th February. 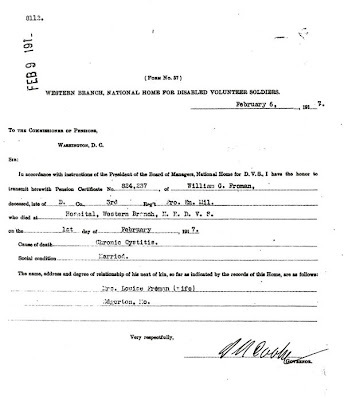 William's file was changed to "dropped" status on 12 February. Amazing! For the longest time, this notice to the Commissioner of Pensions was all I had as proof of my great-grandfather William G[ist] Froman's death. I subsequently obtained a copy of the death certificate from the state of Kansas. Taking the second document on this blog page, let's do some analysis. What can you tell about William G Froman from the information provided? Would you consider this document reliable? Please explain.